They buried Ali Shabaan as a martyr-reporter yesterday, another journalist of the Syrian war to die in action – but a Lebanese this time, unknown in the West but loved in his little south Lebanon village, not least by the girl to whom he was to have become officially engaged this Saturday. Fatima Atwi clung to the railings of the balcony over the road from the beautiful village cemetery – all ficus trees and firs – crying tears that splashed on her yellow-and-black blouse. She wore a black veil and was inconsolable. All Shabaan’s three sisters could do was embrace her. Shabaan – I met him once, briefly, in 2006, during the Israeli-Hezbollah war – had worked this past weekend on the Lebanese-Syrian border so that he could have next weekend off for his engagement ceremony. Shot in the heart. By the Syrians. 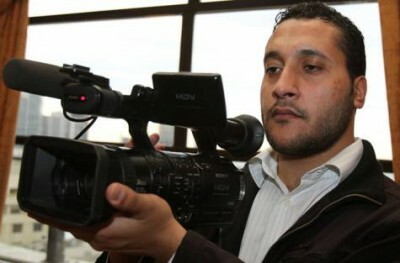 Forty bullets hit the cameraman’s car and that of his fellow crew at Wadi Khaled. A quick death, I suppose. A quick funeral, of course, according to Muslim tradition. They said the fatiha prayer to the soul of Shabaan and placed his body in the dark earth of the little cemetery. In the Husseinia mosque, a portrait of Imam Moussa Sadr, the Lebanese imam murdered by Muammar Gadaffi’s killers in Libya more than three decades ago, was larger than that of Iranian Messers Khomeini and Khamanei. There was a guard of honour from the Lebanese internal security police and a strong clutch of local Shia imams and two representatives of the Hezbollah and a larger clutch of Lebanese journalists who believed that this was the result of – I quote one in particular – “a planned murder, Don Corleone-style”. 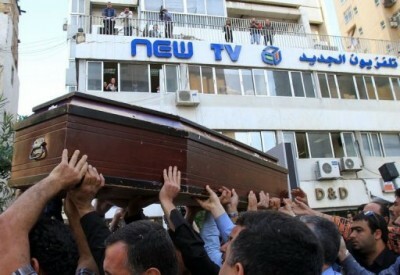 According to them, and to New TV (NTV) officials, Shabaan’s killing was “a message”. But what was this message? Tahsin Khayat and his son Karim are overwhelmed. Shabaan’s dad is Tahsin Khayat’s driver. His sisters were cared for by Karim Khayat’s sister and his brother-in-law. In Lebanon, companies really are families. The Khayat family’s television station has always carried a Syrian “point of view” – they were even allowed into the Syrian city of Deraa at the beginning of the Syrian revolution and their senior cameraman in Deraa was Shabaan. The Khayat family, all Shia, are demanding a “full investigation” – whatever that means – and they have received the support of the Lebanese President Michel Sleiman. But why did Shabaan die? He and his crew had passed the Lebanese customs at Wadi Khaled in northern Lebanon on Monday to film the border and shouted across to the Syrian immigration officers that they were filing for New TV on the Lebanese side of the frontier. The story from his colleagues yesterday was straightforward: after they had identified themselves, the crew began filming and were then told to stop by uniformed Syrian troops. These soldiers reportedly shouted: “Go back.” The crew was reversing its car when a fusillade of bullets crashed into it – at least 40 hit the vehicle – and Shabaan was hit by the first round. NTV’s staff is adamant that at no point did they enter Syrian territory. Thanks to the old post-war 1914-18 French mandate, the border was not delineated as carefully as it might have been – but that’s no reason to kill journalists. Ahmed Shabaan watched the body of his only son placed in the earth. Muslims out here have no coffins. And oh yes, Syria sent its official condolences. Even the least in ‘the society’ think killing one ‘sect’ is ok, but not another. Assad is simply a renegade thinker … kills anyone in his path. The concept of killing runs deep. Has been in the past … will continue, with that kind of thinking. 1- it is still until now, no one knows what kind of ‘project” Ali’s team was doing there. 2-it is still not known until now, why hasn’t the car the three men were driving has not a logo of the tv network to show they are journalist from that network or even still they were not wearing any gear anouncing their profession such as those that has ‘press’ on them when journalist cover war torn areas. 3- it is still unknown, why has the three men asked help from a guide that is nown for his political “tendencies’ [syrian baathist] and a active in syrian security members. 4- it is still unknown why was there a discrepency between the two sides who both support Assad regime…the three men waved for the other side asking for the OK to film there while the other side opened fire regardless. there are some who would say the crew went there to do a report on the syrian refugees but that idea put down by Salam saying this is old news now and so it is not really a scoop for any network now but even if they were going to do a report on the syrian refugees, they needn’t go right to the border where open space exposes them for all sorts of danger, they could have filmed from a near by safer area..
they did not wear any protective gear, is it because they thought they were safe enough because of the prior arrangemets made before they get there…this is stresses them waving their hands to the syrian side to have their OK.
one of the men who made it alive said to al joumhouriya newspaper that he is puzzled as to why they shot at them…he said that i am alouite and that i support Assad and want him to stay in power but after i was subjected to danger i dunno what to think anymore..
Salam then says if the crew from a known Assad regime supporter network went there with a syrian security officer as a guide, it is more likely then that they wanted to do a report in support of Assad regime…. so what was going to be the content in that report? and was the report actually relaying real events or some fictional ones that is going to be created on the lines of Assadi media outlets such as al dunia tv or al manar tv etc? answerig these questions needs to be made from a fully professional investigation rather then criminal investigation. but infortunately in lebanon there is no one professional media organisation that can investigate in the matter to stress the importance in objectivity and honesty in relaying events without resorting to fabrications. Mohammad Salam points out that what’s even more interesting to read in Al Akhbar newspaper, in the meantime, an article relating of an event that only Al Akhbar newspaper knew about and that is an unknown military source said there is theft of weapons from official lebanese storage areas in order to pass it to the syrian opposition in syria. then Mohammad Salam asks, was Ali Shabaan killed while playing a part in a role that was going to be simply fabrications from the network he is working in? also, who are Ali Shabaan’s killers exactly?